When Guardians of the Galaxy was announced to become the latest addition to Marvel’s archive of feature films, I will admit I knew absolutely nothing about it. I didn’t know there was a gun toting raccoon and I didn’t know what a Star Lord was, I knew nothing. It is hard to get excited about something you know literally nothing about, but then I heard fans of the series getting excited, then I saw the trailer, then I saw the movie. Now consider me sold. Having seen and thoroughly enjoyed just about every Marvel movie excluding a couple of shaky moments (Daredevil and Hulk, i’m looking at you), Guardians of the Galaxy is a breath of fresh air. Completely different from any of the recent Avenger based movies, I went into this movie expecting it to be insane fun and I was not disappointed. While you obviously can’t take a movie that features a team including the Norse god of thunder, a man in a flying metal suit and a green ball of rage that seriously; Guardians is significantly less serious affair than other Marvel efforts in many ways. And I do not mean that in a bad way, far from it. This is the funniest Marvel film ever made by a long shot and that is without crowbarring jokes in for the sake of it. Every funny moment fits into the film brilliantly, is fully character based and rotates around plenty of serious acting. This movie takes you on the kind of journey that made the original Star Wars trilogy great. Beautifully realized spectacular settings, fascinating characters and action so good it would make Han Solo blush. Not to mention the brilliant 80s soundtrack that runs throughout the film. Who doesn’t love the hits of the 80s? In the role of Star Lord, Chris Pratt delivers a possibly career changing performance (expect to see a lot more of him) and for the limited lines available to Vin Diesel, many people will choose Groot as their favourite, but I have a special mention for Dave Bautista. Many wrestlers have tried their hand at acting and with the exclusion of Dwayne “The Rock” Johnson, they don’t generally do very well. As Drax The Destroyer, Bautista not only scarily looks the part, but turns in a brilliantly deadpan performance and enjoys a couple of the funniest moments in the movie. Lovely fact time: Dave Bautista of WWE fame, a man who ironically makes Vin Diesel look as skinny as a twig, broke down in tears when he discovered he had got a role in a Marvel movie and Chris Pratt “ruined” a $150k scene by making gun noises with his mouth in gun fight. 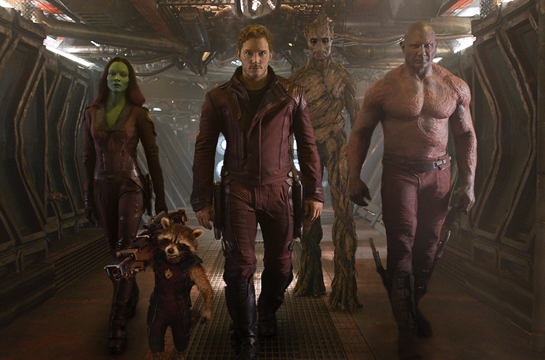 As much as I love Marvel movies lately, I could not recommend Guardians of the Galaxy any higher. If you haven’t seen it, see it. If you’ve seen it, pre order the blu ray and go see it again.